Concrete tiles are made from sand, water, cement and pigments, and are not fired like clay tiles, but cured at temperatures of approximately 60 degrees Celsius. The curing process makes them sturdy enough to be transported and laid within a few days of manufacture, and they get stronger over time. Some of the very first concrete tiles, produced back in 1844 at a cement factory in Staudach, Germany, are still on roofs today. The energy-efficient production process and long product life cycle mean that concrete tiles have a comparatively low environmental footprint. Braas Monier’s latest innovation is a concrete roof tile with Aerlox technology. It is just as durable as standard roof tiles but up to 40% lighter. Not only roofers benefit from this light weight tile in their daily work. Aerlox is also a great alternative for home owners with a weaker roof construction which is not able to carry the weight of standard concrete tiles. Our unique Tegalit flat tiles have clean lines and a contemporary, geometrical design. Similar flat tiles are available in other countries, for example Richmond and Mini Stonewold in the UK, Tegal in Italy, Tegalit in Austria, and Innotech in France. In Germany, Tegalit is available in six different colours, including classic red and various shades of grey. Tegalit works with our innovative Protegon surface: Special pigments on its surface make this roof tile reflect 300% more infrared rays then traditional roof tiles. The roof stays cooler and also cools the surrounding air. The bottom of the Protegon tile may be up to 10°C cooler which leads to an improvement of the air in the living space. The Frankfurter Pfanne, known as the Double Roman in the UK and the Double Romane in France, is a true classic among Braas Monier´s roof tiles. In Germany, the country where it was first produced, it has been widely used for over 60 years, and no other tile has proved as popular. The tiles are available in a wide range of colours and with a choice of several functional surfaces. 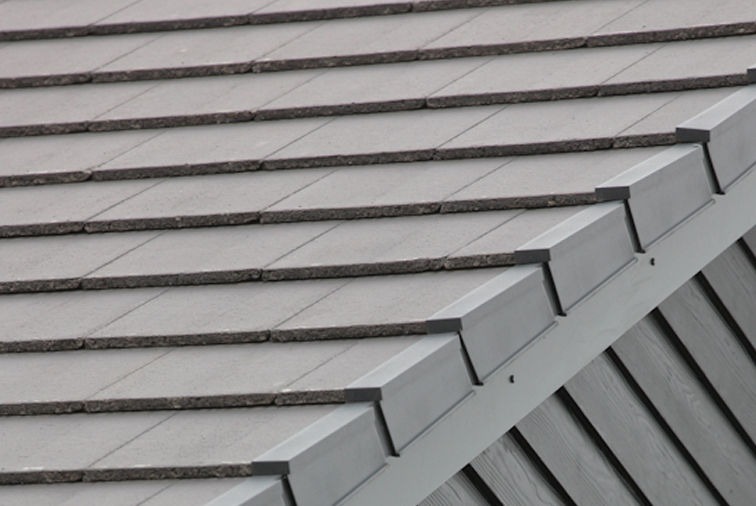 As well as being aesthetically appealing, the Frankfurter Pfanne - among other Braas Monier roofing tiles - also helps home-owners to comply with regulations on the use of sustainable building materials. The Coppo di Grecia is a concrete tile from Italy with a distinctive, visually appealing undulating shape. Its classic look and soft lines make it a popular choice for roofing new-build houses, renovation projects and the restoration of historical buildings. The Coppo di Grecia is available in a range of colours and with a choice of five different surfaces. The Mediterranean look of houses becomes more and more popular in other regions or countries outside the Mediterranean area. Customers who wish to bring a touch of this flair into their homes can choose among Braas Monier’s range of Mediterrano roofing tiles. The colour palette features warm and earthy tones inspired by the Tuscan countryside, the French Riviera and traditional Spanish haciendas, enabling homeowners to create a roof with a welcoming natural look and feel. Tiles from the Mediterrano range are offered under different names in the Mediterranean area. Braas Monier concrete tiles are the perfect choice for home owners who put safety first. They are extremely robust, sturdy and keep the costs under control. From single-family home to the modern villa they stand for reliable long-term solutions in a constantly high quality. Protegon is the future of concrete roof tile technology. Special pigments on its surface make this roof tile reflect 300% more infrared rays then traditional roof tiles. The roof stays cooler and also cools the surrounding air. The bottom of the Protegon tile may be up to 10°C cooler which leads to an improvement of the air in the living space. Protegon has a high corrosion protection and is mostly safe from greening. Each of these characteristics for itself is special. United in one roof tile they are outstanding: The future is called Protegon.